Anyone who is new to the world of recording must always have an understanding of what constitutes a professional sounding recording. Try and think about your favourite song or favourite record. Even though you might be a professional or upcoming music producer, you wouldnt really be thinking so much about the production quality of the song. Rather you would recollect the melody, the lyrics and the chord changes. What you like may not have anything to do with the technical side of the recording process. What is equally important to the listeners is the quality of the song. A great kick or snare sample is useless if the song is utterly boring and lifeless. If your song rambles on and loses the listener’s attention after it starts then it doesn’t matter if the song was recorded and mixed at Abbey Road Studios and mixed and mastered by the world’s top engineers. Beautifully recorded drum and kick samples are just noise in the absence of a good song. Let’s look at the points required to be taken care of in order to make the best recordings in ascending order. If you are just recording music for other people then the first 3 points below are out of your sphere of influence. If you have some sort of final say in terms of the song arrangement and final mixing then you are a music producer and not just a recordist. How to create a good song is entirely out of the range of this article! Even a great song and melody can be turned into Mazak (Crap). So if you can help it always ensure that the best musicians you can get play on your track. Best does not actually mean “technicaly sound” but rather someone who has experience playing live as well as recording music and who can understand the feel of the song. Have someone play drums, keyboard or guitars who can hit the mood of the song. If you are responsible for the music arrangment on your DAW, ensure that you are extremely critical of how the song is arranged. Think deeply about the intros and the outros, whether the song needs a bridge, could the last verse be shortened, is the solo too long. Think deeply about all the many decisions that you have to take as a music producer. If you are working with live drums, ensure that you know how to tune drums. If you are an arranger, learn atleast play basic drums and know the different components of a modern drum kit and how the individual instruments like the snare, hi hat and tom toms interact with each other in the course of a groove. Learn to understand the nature of different sounds. Use the best quality musical instruments always and you will ensure that your recording sounds superbly pristine and perfect. If you are a home studio producer then more often than not that’s you! You need to have your recording set-up in fine condition which means no buzzing monitors, intermittent cables, one eared headphones etc. And always be ready to hit record at a moment’s notice. Buy good microphones and understand the qualities of your microphones and which mics to use on which sound source. Know your mixing board or DAW inside out. And always be ready to bend or break some rules to find your own unique sound. If you are recording inside your home, then the room must sound good. Of course we are not in a professional recording studio, it’s your home! So some compromises will have to made. But there are some very easy and inexpensive things that you can do to improve the acoustics of your home studio mixing and recording spaces. We will talk more about this in a future article but suffice it to say that a room with acoustics problems will cause a huge amount of problems. And these things cant be fixed by buying more expensive microphones or by turning a few knobs on the mixing interface. Even if you have a basic microphone and a basic DAW you can create a great song if you can accurately hear what you are recording. Without good reproduction, no amount of great gear can save you. By monitoring we dont just mean a great pair of monitor speakers but also knowing how to record microphones and how to listen an adjust before going in for a take! 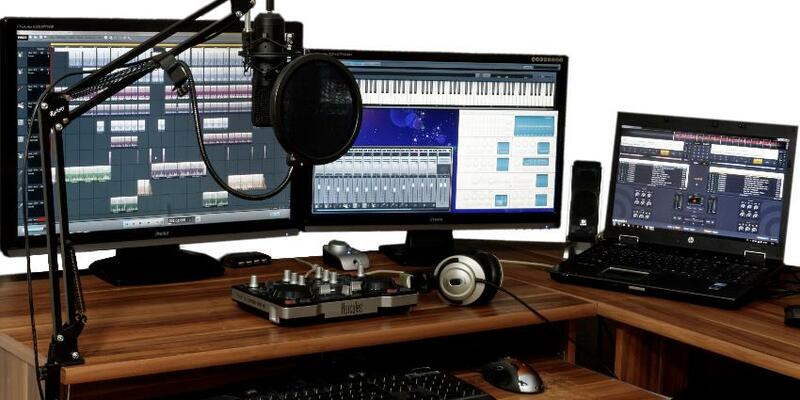 At the minimum you will need a good quality dynamic or condenser microphones and also a good quality sound card or audio interface to integrate the microphone into your DAW. The interface will feed your recording software be it Logic Pro, Reaper or FL Studio. Don’t be fazed by all the gear. Just remember that your main work as a music producer while recording audio is to just catch the audio into the machine and then somehow get it back out! You can use the above list to prioritize your “shopping list” for your studio. Let us hypothetically assume that you play the guitar and sing, have a bedroom to record in, a decent laptop with a sound card to make the recordings, a Shure SM 57 microphone, some great song ideas and a decent pair of monitor speakers. What you do not currently have is a great vocal microphone plus your studio has a lot of “pinging” echoes and a “boxy” room sound. What is the next thing that you must invest in? Well check the list of priorities above. The acoustics of the room is higher in the list of priorities than the mic so you need to get that fixed. Mos of the gear companies like sound card and mic manufacturers spend a lot of money advertising the superiority of their products and make you believe that you must spend a fortune in buying a certain brand of sound card or mic. It is after all in their best interests to do that! Remember now that we live in an era where the processing power that you possess on your laptop or PC is what most major recording studios had 20 years ago! So basically you have a better recording studio in the bedroom than what the Beatles had when they recorded Abbey Road! Think about that immense power that you have in your hands right now and go out and make that next hit song!